Writing songs can leave you with a trapped feeling. Often you’re alone with no one to ask for assistance. It’s like being an elderly person who has fallen and whose Life Alert has just run out of batteries. This claustrophobic feeling is like being in a box. Wait a minute. We’re going to talk about boxes today! Damn, I’m getting good at writing these intros. Hey everyone. Welcome back to Escape From Second Verse Hell. You can check out Part 1 – Second Verse First if you haven’t. Today we’re discussing a technique used for song development called “boxes”. although the two are very complimentary to one another. 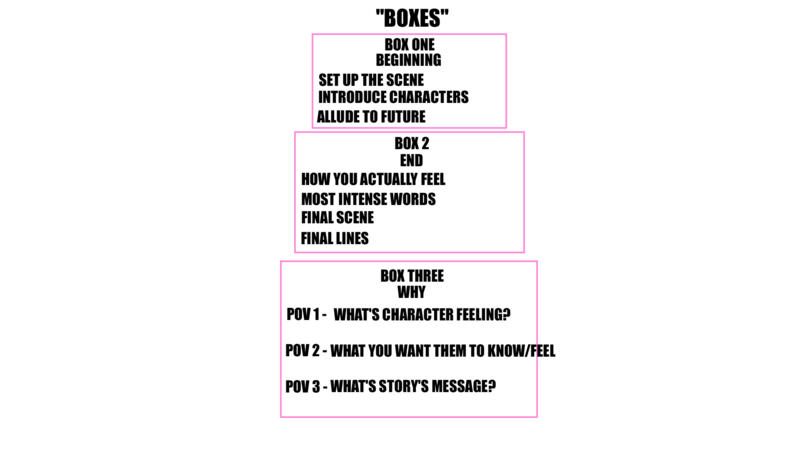 How it works is this: when you have a problem developing your story you draw three boxes, one bigger than the other. In your bottom box (the biggest one) you put your why; why is the main character saying these things? Remember that it’s your character’s why – not yours as a songwriter. This why should be the foundational resonance of your song. In your second box you put how the song ends. This one is typically easiest for most people since the first thing they write tends to tell the whole story. The top box is how you’ll start the song off. You might think, “Why do we have a why in the bottom box instead of a beginning-middle-end format?” Good question. Your middle can go between box one and two. It’s important to state your deepest message into the song though so, by resolving that into your why, you’re guaranteed to make use of the third box that way. I hope this is clear guys. This has been the most helpful songwriting technique I’ve come across. I used to struggle with verse development. I really had no idea what verses did nor how they affected the chorus; at least not in any conscious way. There are a ton of popular songs which have little-to-no verse development. Despite that, once you realize how effective proper pacing can be there’s no going back.
. Spending a little time reading that before you start scribbling out couplets can really make the time you put into the craft more rewarding. Thanks for reading. I’ve got some new songs I’ll be posting soon. Let me know if this was helpful and what you’d like to see from me in the future.